Jack Thompson’s acting career spans more than 40 years. He has appeared in over 70 films, including the Australian classics Breaker Morant and Sunday too far away , as well as in numerous telemovies and series. A true believer in the importance of a vital local film industry, he received an Order of Australia for his services to the Australian film industry. He is a committed environmentalist, member of the National Gallery of Australia Foundation and Australian Good Will Ambassador for the United Nations High Commission for Refugees. Bergstrom worked with Thompson in her studio on many occasions. He enchanted her by reading some of his adoptive father’s, John Thompson’s, passionate poetry. Over a relatively short but concentrated period of time, Bergstrom did many drawings and paintings of him. Disregarding ‘the usual neurotic, frustrating times associated with painting’, she found working with the quintessentially Australian Thompson ‘a sheer delight and a most memorable experience’. Bergstrom often uses more than one canvas in her portraits to create a time sequence or capture different aspects of her subject. 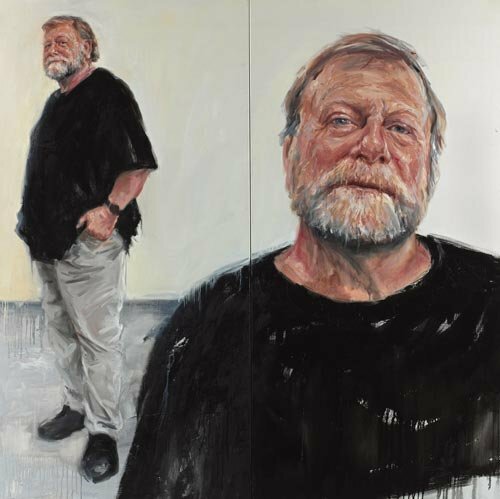 Born in Sydney in 1957, Bergstrom has exhibited regularly since 1980 and has been represented in the Portia Geach Memorial Award, the Doug Moran Portrait Prize and the Kedumba Drawing Prize as well as the Archibald Prize. She also won the 1995 Packing Room Prize for her portrait of Jon English (although, in that year, her work was not selected by the Gallery Trustees as a finalist for the Archibald).